If GOP union-busters continue to refuse to compromise today, they will cost the state $165 million — more than the entire 2011 budget deficit. When he announced his "budget repair bill," Gov. Scott Walker (R) warned that Wisconsin would miss out on the single biggest piece of the savings — $165 million in revenue from restructuring state debt — unless the bill is "enacted by February 25th to allow time to sell the refinancing bonds." The debt savings would be larger than Wisconsin's 2011 budget shortfall of $137 million. While unions are offering to make the compensation concessions Walker has demanded, the governor is refusing to cut out the union-busting bargaining provisions of the bill and allow the legislature to move forward on the portions of the bill that enjoy broader support. Gov. Walker's proposal threatens workers with an annual pay cut. Walker and his allies insist that his proposal doesn't eliminate collective bargaining rights for public employees, and merely limits bargaining to wages. But the proposal specifically limits wage increases to "a cap based on the consumer price index" — a measure of inflation. That means workers can never get a raise that actually increases their buying power, but even worse, it forces workers to come to the negotiating table hat-in-hand just to keep their pay from falling behind rising prices. Conservatives say they're allowing workers to keep some bargaining rights, when in fact they're forcing public employees into an annual begging ritual just to keep the same real wage they earned the previous year. Republicans won the election, but voters don't support this power grab. 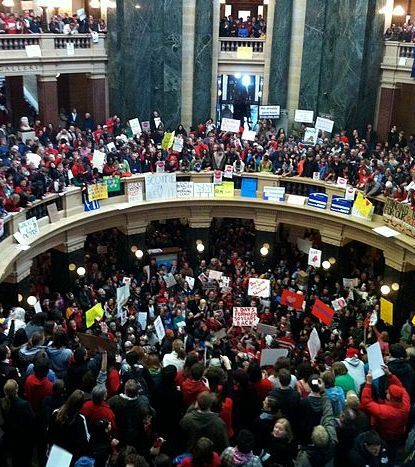 Earlier this week a union-commissioned, independently administered poll found 58 percent of Wisconsin likely voters oppose eliminating collective bargaining for public workers. Yesterday another poll found 56 percent of Wisconsin likely voters believe the state's public employees should have bargaining rights. Nationally, 61 percent "would oppose a law in their state similar to" Walker's effort to end bargaining for public workers, a USA Today/Gallup poll found this week.